Okay, so how many times have you allowed yourself to be suckered in by some article or program about the origins of Christianity only to find it full of modernism, heresy and faulty history? Your eyeball twitches as you attempt to sit through at least the next ten minutes, until finally you shut it off in anger when Jesus Seminar luminary and heretic ex-priest John Dominic Crossan appears on the screen jabbering about the historical Jesus. In such popular documentaries on Christianity, I am very interested in how the phenomenal growth of Christianity in the Roman Empire is presented. In looking at the reasons most commonly put forth, we can see that they are all worldly and secular. For example. it is stated that Christianity grew because, unlike pagan religions, it accepted the poor. I don't know where people get this idea that pagan religions "didn't accept the poor" - sure, the poorer Romans wouldn't have had a chance of being initiated into the Elusinian Mysteries or of becoming Vestal Virgins (just like today the Church of Scientology and Kabbala seems to be restricted to the rich socialites), but Roman religion was syncretist and practical, and thus had gods and rituals for every walk of life. The poor certainly were not neglected by pagan religion - in fact, as we learn from the accounts in the life of St. Benedict, it was the rural poor who clung to paganism the longest. The poor had access to religion in paganism, even if it was only the vulgar cult of Priapus. To be sure, Christianity offered more to the poor by way of charity and egalitarian acceptance into the Church, but to say that the poor had no share in pagan religion is way too simplistic. The poor and even slaves were sometimes admitted to the obscene Bacchanalia alongside the wealthy, which were going on in Rome and Greece way prior to Christianity. There are similar assertions about Christianity's growth that say it was because of its acceptance of women, but again, women were always accepted in pagan religions - some cults were exclusively made up of women, like the Bacchanalia, which were led by women and originally reserved exclusively to them. We could also mention the priesthood of Cybele and other cults, which though they were shameful, cannot be said to have been restrictive of women. Christianity certainly did elevate the status of women, but again, this was not as radical a break with pagan tradition as some would assert, and certainly a little bit of social advancement was not enough incentive on its own for Perpetua and Felicity to endure their grotesque martyrdoms for. These are weak explanations of why Christianity grew. 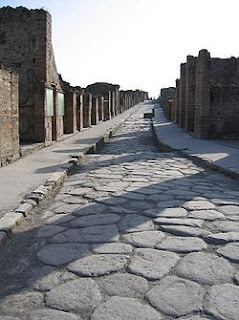 The Roman Roads also served Christianity. Although the early Christians often suffered tremendous persecution from the Romans, the Roman Roads permitted the apostles and many of God's people (particularly those who held Roman citizenship) to travel much more easily, while protected by patrolling Roman troops from detachments who were stationed along the way. It's actually quite ironic that the infrastructure of the empire that attempted to destroy Christianity also made possible its spread to the very farthest frontier regions of the then-known world. I don't debate anything here, but this is listed as the first reason why Christianity spread, and furthermore, no other reasons are given. Roman roads certainly made travel easy, but that's an obvious redundancy - like saying that my drive to work was made possible by the car I was riding in. The Roman road system was neither the primary reason for Christianity's spread nor the only one. Take, for example, the rapid spread of the faith through rural Europe in the so-called Dark Ages: Ireland, Scotland, Germany, Scandanavia, etc. None of these places had the benefit of "Roman roads," yet zealous monk-missionaries spread the faith there just as effectively, proving that Roman roads were not a prerequisite to the quick and effective spread of the faith. Although there were Arab conquests, the biggest reason Islam spread so rapidly was not because of the sword, but because of conversion. People were accepting Islam because of the message it was sending and because the Islamic world at that time had such a huge impact in world literature, arts, sciences and philosophy. When Islam appeared it played to the Arabic sensibility that they were the real chosen people ... [it] brought a very real improvement to the sense of worth in the Arabic world. Did you hear that? Christianity spread because of Roman roads, but Islam spread because it made the Arabs have high self-esteem! Now that we've looked at some of these over-exaggerated worldly reasons put forward for the growth of Christianity, next time we'll look at the true, supernatural explanations to account for the conversion of the Roman Empire. Philip. You should add your name and profile at the top right of your blog. I've been looking for 15 minutes as to WHO owned this blog.